The internet owes a lot to Dave Winer. After all, he is one of the people that stood at the base of RSS, something I personally learned about when he later pioneered podcasting (together with Adam Curry) by allowing for files to be referenced in the XML of an RSS feed. Through the years he has been criticized by many for his opinions, while he has always been fighting for an open internet. That doesn’t mean he is without his flaws himself though. And this blogpost kind of hit a wrong nerve. After reading about his thoughts on Gawker and the Open Web, then about Blogs and Wikis and them being about people. I found the post he wrote about the .blog TLD owned by his “friend Matt Mullenweg and Automattic” and how good it was that they allow people to run other tools on that domain. 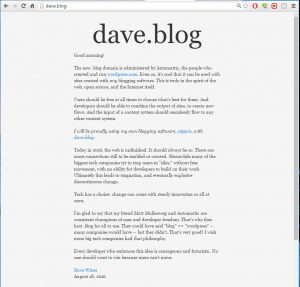 He already has a .blog domain, the post is being hosted at dave.blog. Cool, I thought. I want one of those of my own, pierre.blog would be cool, I though. So I tried to find where to register a .blog domain. I ended up at this page with info. It turns out I have to wait. On August 18, the period where trademark owners could apply started. Then on 2 November the landrush period will start. That is a period where anyone can grab a domain name, first come first serve, if there is no trademark on the name. Then on 21 November it would be available to all. Now, I don’t believe “dave” is a trademark, so Dave Winer could not have applied for a .blog domain through the regular channels yet. So, he has his friend to thank for that. If I, as a regular blogger want to join the queue, it is going to cost me a bit more: €100,220 Early Application (€100,000 registration + €220 application fee) to be precise. And for all the Dutch readers: that is 100 thousand euros registration fee. But it is risk-free: They can’t guarantee I’ll get the domain, but if I don’t get it, They’ll refund my payment in full. 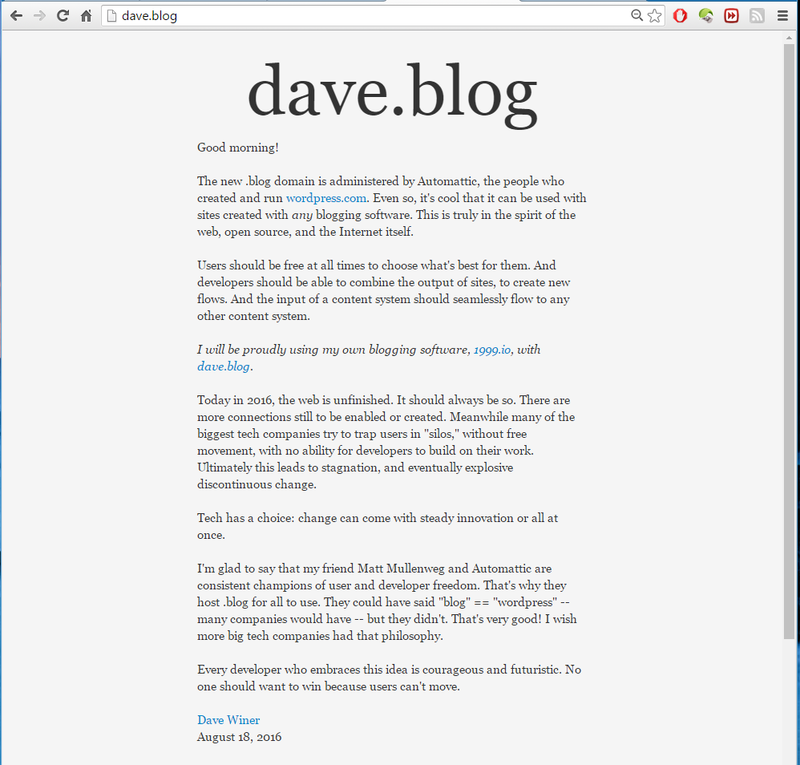 So to me, the .blog TLD is not really an example of how the internet is still open. It still is a place where the corporations rule, they did so back in the day when only corporations could register .nl domains, they still do so now.